She talks about the process as a whole, and here are times (like every other page) where I nod my head and say, “Oh my god, that’s so me.” That thing writers do when, after sitting down to write, their brains turn on them and start reading off a laundry list of things that have to be done right then instead of focusing on writing. In the past week alone, I’ve sat down to write and ended up brushing my teeth, vacuuming the floor (white floors + black dog = NEED TO VACUUM NOW), and, in one particularly neurotic streak, unpacked all of the Christmas decorations even though we don’t have a tree yet. Apparently this is common with writers. We’re insane and avoidant. And misunderstood geniuses, too, don’t forget. I love this book. Love it. It’s short, but surprisingly dense. It’s one of those books that I just want to hug and squeeze and thank it for being there for me. The last book I read like that was “An Object of Beauty.” I recommend both. What are you reading right now? I vaguely remember reading that book in college amidst all of my other English classes recommended reading. She was/is one of my faves still. I haven’t read lately, but it’s on my list to do more of in 2012. Thank you for sharing! I’m also writing a book, and though mine is not a novel but a non-fiction book, I still think this could be helpful. I’ve been wanting to get this book for so long. At one point, I had both Writing Down the Bones and Bird by Bird in hand, trying to decide between the two. Writing Down the Bones won. Now that you’ve read and recommend it, I’m inspired to make a purchase happen. Like right now. As you know, I love this book. When I was very much a writer, it was very much by my side and it still has a pride of place on my bookshelf (and T, there was no winning….you’d win with both those books, for reals, but you really do need them both). 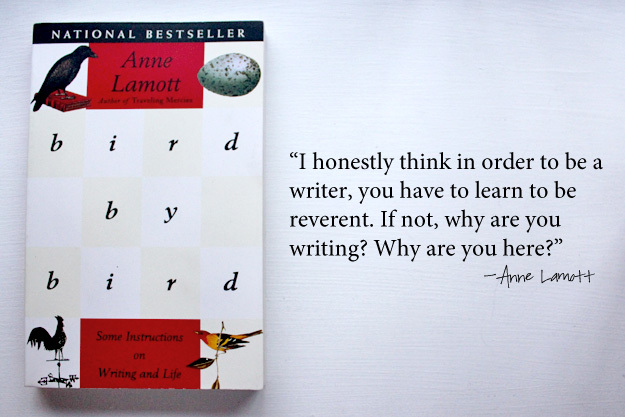 Anne Lamott is brilliant, but better than that she’s very real. Like you, it felt like she was inside my head, the little bird (pun intended) on my shoulder. When you’re ready to have a child (I know, not yet), read her book about her son’s first year of life. It’s pretty special too. Oh man, sounds like you and I might be from the same school of procrastination. I’m currently trying to get through 3 piles of magazines: New York Magazine, Architectural Digest, Self, Food & Wine. You name it, and it’s in one of those three piles. Sigh. I can’t believe she stole the name of my autobiography! that book sounds really interesting! thanks for the introduction, and good luck with your writing.